As Republican presidential nominee Donald Trump prepares for his big speech tonight at the Republican National Convention, Trump’s promises about the coal industry are getting some attention again. If I win we’re going to bring those miners back. Amid the federal government’s reform of coal-leasing nationwide, new environmental regulations and coalmine cutbacks and layoffs, a new report from the Energy Information Administration suggests things are likely to get even grimmer for coal mining … While the EIA’s report shows that federal regulations have played a part in industry decline, historically cheap natural gas has outcompeted coal, making it harder for coal companies to stay in business. A key congressional ally to Donald Trump said the Republican presidential candidate would focus his coal policies first on slowing down the industry’s rapid decline. Your assumption that Mr. Trump can’t bring back coal jobs to West Virginia is a total farce as everyone knows that Obama’s War On Coal with his EPA regulations is mostly the blame for the losses of those jobs. 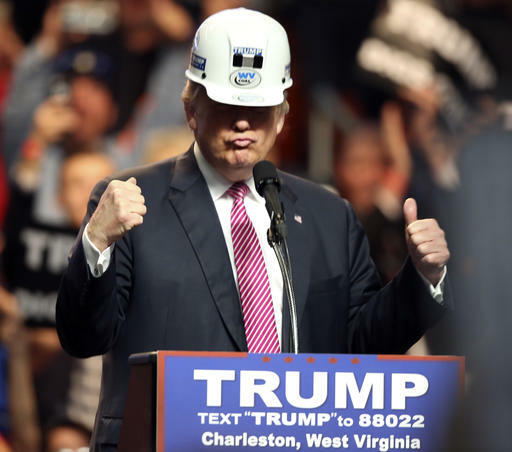 Sure Natural gas has deposed some jobs as some utilities have switched but Mr. Trump rolling back some of the over regulation will definitely help to restore mining companies and thus mining jobs.